One Atlantic salmon was recovered by the club in 2001 and and two in 2002. 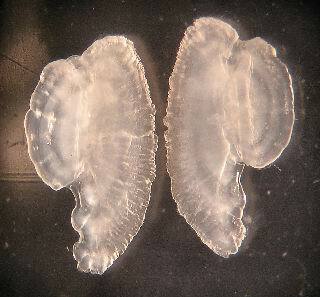 The ear bones (otoliths) were removed and sent to Karin Limburg for analysis. It can be determined where a fish has lived by analyzing the amounts of strontium (Sr) and calcium (Ca) found in the ear bones and knowing the characteristics of the water in which the fish lived. This report was compiled from e-mail correspondences between Karin Limburg and Allen Fannin. The Fish Creek Atlantic Salmon Club would like to give thanks to Karin for her help and cooperation. I managed to squeeze in the time to mount and grind your salmon otoliths,The points measure 20 microns across and are spaced about 42-58 microns apart. Thus, I would interpret this as the SP-01 fish being born and living in some other body of water for its early life, then moving into Fish Creek, and finally moving into Oneida Lake. You should be able to fill in more details, and maybe let me know. This is a great demonstration that Sr:Ca (Strontium : Calcium) can be used as a tracer of fish moving between some of the Oneida tributaries into the lake itself. The relationship between point spacing and time is loose. Otoliths increment over time, but not evenly, so the evenness of the spacing does not correspond 1:1 with time. You'd have to do light microscopy to determine the temporal correspondence of the points. My microscopy setup is out of commission at the moment, but when I get things in order again, I will try to photograph the otoliths. In terms of further analyses on more fish, the hourly rate of the electron microprobe is on the order of $70 (I need to check this, but that's what I recall). An otolith takes about 45 minutes to analyze. Then there's time associated with carbon coating, mounting, and getting the analytic procedures in place, as well as measuring standards. This doesn't include any labor costs (e.g., my time or someone else's time). Nor does it include the time for preparation, which varies considerably with expertise. But that should give you some rough numbers to work with. Hope you are happy with these results. All three fish were hatched from eyed eggs obtained from the Casco Fish Hatchry in Maine and raised in the Beaverkill Trout Hatchery to a 25mm post swim-up stage. This would put them at approximately 4 weeks post swim-up, depending on hatchery water temp. All three fish were put into Fish Creek at the 25mm size where they remained until they outmigrated to Oneida Lake. There are some differences in the three fish. SP-01 was captured by the staff at Shakelton Point Field Station in 2001. SP-02 was captured in 2002. Both fish are of the same age, SP-02 having been raised a year later than SP-01. CD-01 was angler caught at the base of the Caughdenoy dam in 2001, however, it is of the same year class as SP-01 according to scale samples.